So … cats are basically magic. And this can be proven. With science. This visual appears with Ms. Sudol’s post. Graphics by Gemma Busquets. FACT: Cats can help you live longer. But science says that in studies about pet owners versus non-pet owners, folks who owned cats had significantly fewer stress symptoms. Dog owners were #2 in low stress. And in last place? People without any pets. And here’s the kicker: Owning a pet (cats and dogs) in general reduced stress-related blood pressure more than medication designed specifically to do that (aka ACE inhibitors). FACT: Cats can reduce the likelihood of having a heart attack! By 40%! The University of Minnesota found that owning a cat might actually be good for your heart, and not just in an, “Oh my gosh, I am just so overwhelmed with love for this animal!” kind of heart stuff way. In their study, they found that folks who did not own a cat were 40% more likely to have a heart attack and had a 30% higher chance of dying from heart disease than cat owners did. Which is just like … what?! See? Less stress, less anxiety = fewer heart and blood pressure issues. Also, probably more tripping over cat toys at two in the morning, but I couldn’t find anything about that in the study. Oops. Thanks for the heads up on this article, Debra Holland. Give your kitties fresh water every morning, quality food morning and night–food with no corn or other fillers and no “meat by-products” or “chicken by-products”–and lots of hugs and kisses and playtime every day. If they look lethargic, try to hide, or seem grumpy when you try to feed or pet them, they may not be feeling well. If this continues for hours, take them to the vet for a quick check. You may save their life, just as they are saving yours. 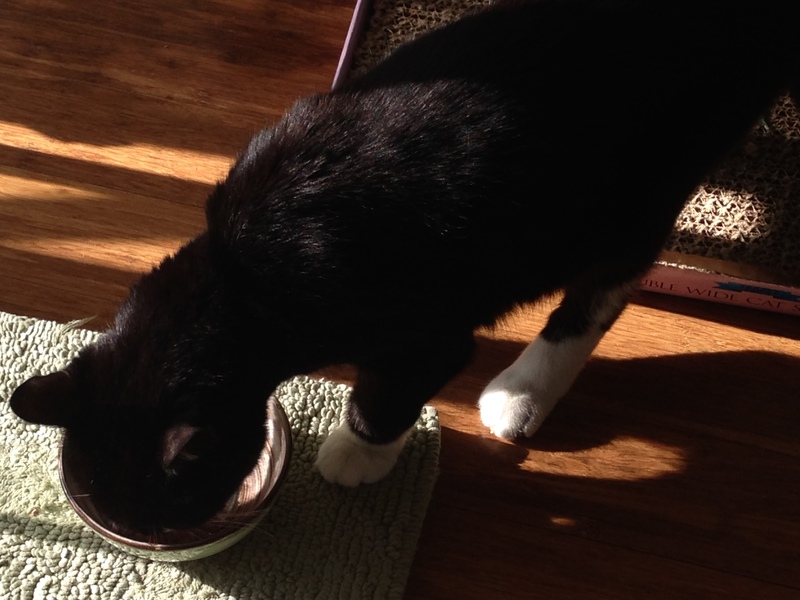 Tuxedo likes to eat solo. Some like to eat together and others like their own bowl. My cats get 8 drops of colloidal silver suspension in their morning water; this keeps their immune system boosted and seems to prevent fleas (See earlier blog on this topic). I also give them pro-biotic powder from the pet food store to help prevent digestive issues that crop up from eating commercial cat foods for years and years. They get supervised visits outdoors in a protected yard, where they can bird-watch, eat grass, and roll in the catnip. 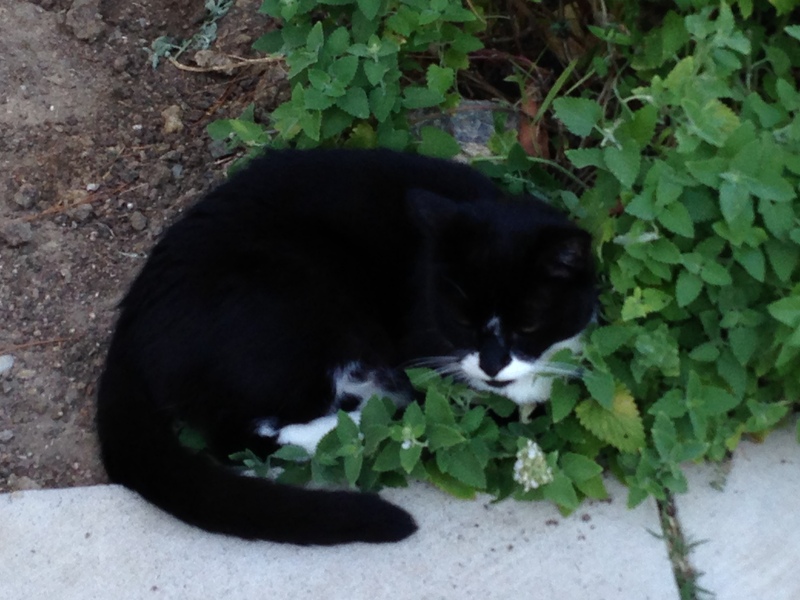 Tuxedo cozies up to the catnip. Art is Not a Thing. It is a Way.